From spraying Aerosol into a group of people, to bombing a train station on March 20, 1995. Aum Shinrikyo is not giving any mercy for Japan. Aum Shinrikyo is a group that settles in Japan. 1500 of Aum Shinrikyo is still in Japan, and about 300 reside in Russia. They try and hit places with plenty of people. In 1986 they found the terrorism organization. 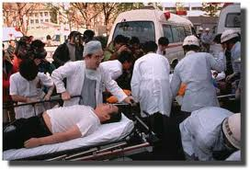 Over the years it grew bigger and now the U.S. Department says that Aum Shinrikyo has about 40,000 members worldwide. Aum Shinrikyo usually attacks their innocent victims by wrapping mixed chemicals into plastic bags and wrapping them in newspaper. In 1995 they set a massive plan of destruction to bomb the Japan subway station. They used the mixed chemicals and wrapped it in newspaper. After those bombs went off, it killed about 12 people, and almost 6,000 other people in need of emergency services. That was considered the biggest Terrorist hit in Japan. The community was targeted for a specific reason. In the community layed the residence of the three judges that was on the panel from a lawsuit of real-estate that Aum Shinrikyo was the defendant. The judges accused them of doing something wrong. Aum Shinrikyo didn’t like the idea of that. So they set a plan to destruct the community. The victims of the Japan hit had no time to fight back. The bombs of mixed chemicals went off in seconds. The people of Japan had no idea what was coming. When the bomb finally went off, people started running. It wasn’t a game and they had no time to waste, it was save their own lives, or die. On Feburary 15, 2011, the death penalty has been affirmed, and announdced for Masam Tsuchiya. The chemical maker for the 1995 Tokyo subway attack. The victims of the 1995 hit are now living their everyday lives, but will always be affected by the tragic incident that happened.